Michigan Governor Gretchen Whitmer has toured the floor of Cobo Center for the North American International Auto Show. 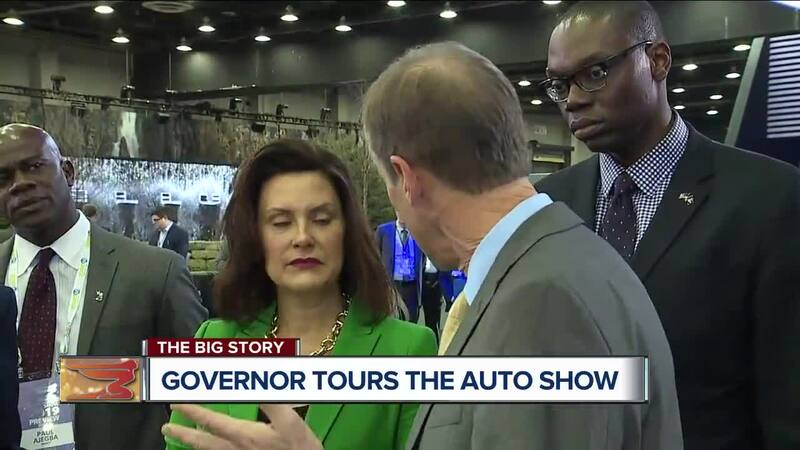 COBO CENTER (WXYZ) — Gretchen Whitmer has been Governor only 15 days and she walked about the Detroit Auto Show like we all do, a kid in a candy store. She spent almost two hours going through every display, every company - domestic and foreign. She’s also had some meetings behind the scenes with auto executives. What do they want from her? “They just want to know that Michigan’s open for business that we’re going to lead in the mobility space,” the governor said. Detroit Mayor Mike Duggan was also back on the show floor and got into the souped-up Shelby GT. We asked if he’s a buyer or a looker. “When I saw the new Ford Explorer makes me want to buy,” the mayor said.